Illustrator CC| Level 2 will delve deeper into more advanced Illustrator tools and techniques like creating your own brushes, using the Gradient mesh tool, 3D objects and more! Learn to create 3D objects, advanced gradients, infographics, business cards, graphs & more! 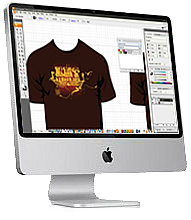 Adobe Illustrator | Level 2 is intended for designers looking to advance their skills with Illustrator, learning new features, new work flows, tips, tricks and advanced features. and Onsite Illustrator Training nationwide.